Heartbreaking, hopeful and utterly transporting, a luminous celebration of the strength of the human spirit. Come Away With Me is a profoundly moving story of one woman’s journey from unfathomable loss to healing through love, family and travel. Tegan is a newly married young woman with everything to live for, until an awful accident changes the course of her life forever. As she narrates the novel in intimate first person, she is consumed by self-pity and anger at her husband, Gabe, who she blames for the accident – he was driving when their car skidded on black ice one wintry Chicago night. But one day Gabe, in an effort to kickstart Tegan’s healing process, remembers the ‘jar of spontaneity’ they had started in happier times. It contains all the dreams they’d like to fulfill in life – rather like a bucket list – only more romantic. This leads to a trip around the world, the one they had promised themselves when everything was rosy. But it’s not that easy to heal the pain of something as profound as Tegan has suffered. 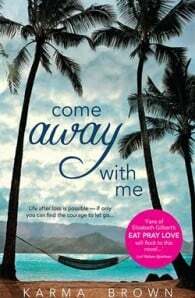 Despite trying to immerse herself in the exoticism of Thailand, the gorgeousness of Southern Italy and their beloved surfing destination in Hawaii, she can’t find it in her heart to forgive Gabe and rekindle her will to live. Then towards the novel’s close, in a dramatic twist, we learn just why Tegan is so unable to move forward. This is a novel that explores the stages of grief and, despite the poignancy of the subject matter, there is much that is tender and hopeful in Tegan’s story. With the love of her family and through adventure and travel, she ultimately finds healing and resolution. This is a timely book for spring, ideal to take for a weekend’s reading at the beach; with its travels around the world, you’ll be transported to another place.